The GLOBAL 3D will be held in Venlo, Netherlands from July 7th-9th 2017. Team Mikado will be there of course at this competition. Please stop by there at the Mikado booth. Horst Wedl from Austria has done a magnificent job by flying his K-Max 1200 mit 2x2.5m Rotor at the Heidelberg Meeting in Germany! - Sometimes the telemetry connection gets lost at the moment of the end of the coldtstart init process. This mainly happens if the antennas have been placed very good and the Radio is very near (overdriven link). 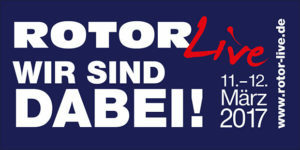 We are proud to attend ROTOR Live again in 2017! Come and visit us at our booth, check out our new products and feel free to ask all the questions you have, we are always available for a little chat—we are looking forward to seeing you there! We will show you some basic infos and examples of the NEO Macrocells in our new Video serial.. Update 01.04.2017 - 2 more videos! 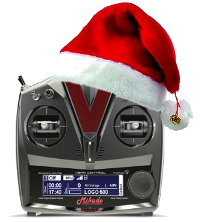 As a tradition we do another update at Christmas 2016 for VBar Control. With this Update the MAC Simulator Interface will work again with Sierra. The USB Simulator interface now allows all switches and all pots to be used in the simulation for Mac and Windows.